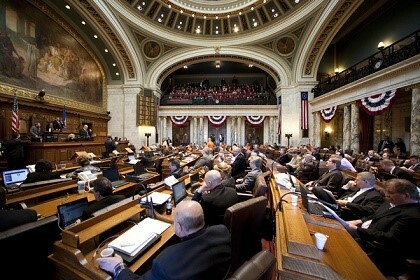 http://newiprogressive.com/images/stories/S5/assembly-wi-s5.jpg Bills focus on non-partisan redistricting, campaign finance reform, and restoring democracy. Promise “A Fresh Start For Wisconsin”. “You can't have good policy without good government. Unfortunately, over the last eight years, our state government has become increasingly disconnected from the public it was elected to serve. There is no greater reminder of the importance of an open and transparent democracy than the 2018 election,” Rep. Hintz stated. “Republican gerrymandering led to a 63 seat majority despite Democrats winning every single statewide election. And gerrymandering lead to the greatest attack on democracy in our state’s history during a lame duck session that stripped Governor Evers of executive power before he took the oath of office. Non-partisan redistricting: The Iowa Model has been introduced in past sessions with a few minor technical changes. Senator Hansen and Representative Vining are the lead authors. Campaign Finance Reform: This bill would repeal many of the provisions of the 2015 campaign finance overhaul by the Republicans. It includes stopping unlimited individual contributions to political parties and legislative campaign committees and stopping unlimited contributions from legislative campaign committees and political parties to candidate committees. And finally, it eliminates segregated funds for political parties and legislative campaign committees. Representative Sargent will be introducing this bill which is similar to her bills AB446 and AB447 from the 2017-18 legislative session. Lame Duck Constitutional Amendment: This constitutional amendment states that the legislature cannot change the powers of another branch of state government during a lame duck session. Representative Spreitzer will be the lead author of the amendment. Open Records / Open Meetings: This will be two separate pieces of legislation. The first is a constitutional amendment that would enshrine current open records law in the state constitution. The second is a bill that clarifies that open meetings law does apply to the legislature.